Next post: A post is not a podcast. In this episode: I mourn the bad end to a really good pair of socks. Alas, poor Uzu. I hardly knew ye at all. Yes, it’s a tragedy, but it might have a happy ending. If your freakishly tiny delicate feet fit my attractively felted Uzu socks, they can be yours. Leave a comment below. I also reminisce about Chub Creek, my friendship with the boys, and our podcasting salad days. It would be lovely to see the Dink Dolls again. Can you help bring Dave and Gary home? There’s juicy knitting goodness in the progress of Damson, still on the needles as I ponder right sides and wrong sides and edgings. Oh my. I finally get my hands on knit, Swirl! Uniquely Flattering, One Piece, One Seam Swirl Jackets , by Sandra MacIver, and my head explodes from the genius. All the sweaters are on Ravelry, of course, but don’t forget to check the projects and see what other knitters have created. Inspiring? Oh, yes. My Audible pick this week is Packing for Mars: The Curious Science of Life in the Void, by Mary Roach. Also recommended, (though read, not listened to) is Stiff: The Curious Lives of Human Cadavers. My Selfish Knitting Month continues with Lanesplitter Skirt and Claudia Evilla. Are there other great knitted skirts I should know about? Tell me all about them in the comments. There are also Apologies, but they come last. Music by Dave Nachmanoff, Year of the Cat, from the cd Wordless Rhymes. Love the Claudia skirt, not sure I can pull off the Lanesplitter. Don’t have the body for it. Claudia seems more forgiving…. Happy happy that you’re podcasts are more regular. Nobody does it better! Loved the show, as always. Looking at all the pretty Swirl patterns on Ravelry is making me almost want to give that look another try– I am, how shall we put it, a bottom-heavy lady, and that silhouette has historically not been good to me (think bunches of fabric at my lower back), but all the things are so pretty! So sorry to hear about the shrinkage of your pajama socks. I wear a size 6 (US women) and I’m wondering if they would fit me! Just discovered your podcasts this past week and LOVE them! Chubb Creek was so lovely! I hope the boys find their way back home to you. I hope the real life boys podcast again one day. Loved the episode, and I can so sympathize about ‘tweaking’. I have two freakish daughters (they wear size 6 US shoes) who would love your felted socks. So sorry about your socks! I wear size 7 US, but they sound like they might fit my feet. I’d love them. Oh, those poor socks. I fear my feet would actually be too small for them (I have extremely freakishly small feet, English size 2 and 1/2). I hope the socks find a new happy home. As for gardens, my strawberries are trying to fruit. 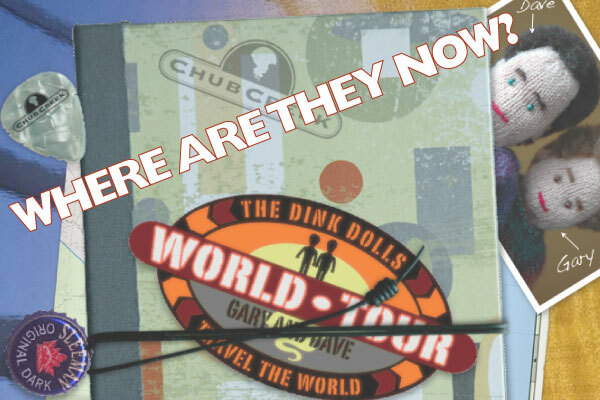 I hope the Dave and Gary dolls find there way home! Thanks for another great podcast. I hope the Dink Dolls find their way home. I also hope the pajama socks find a new home. Have you started their replacement pair yet? No worries about Welsh for Rainbow. I can’t wait to see it, but I know it will be on it’s way when you are ready. Stay warm!! Brenda, I just wanted to say that I love the new format of the show! I’ve been listening since 2006, and it’s so nice to have regular Cast-On. 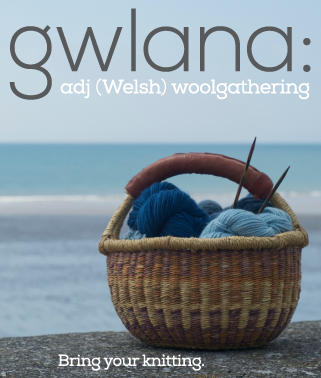 The shorter episodes are great for my commute, and I really love just listening to you talk about your knitting – no need for any fancy bells or whistles. Thank you. oh i’m so sorry for your socks, they’re still too big for me (my feet are about the same size as Alessandra’s) … however, I have given a few pairs of felted socks a good home. Love the podcast being listening for years. My delicate feet will also fit your socks as this the size I’ve just knit for my first pair. wow, wow, WOW! I’m the one with the “exploding head”, after all those compliments. 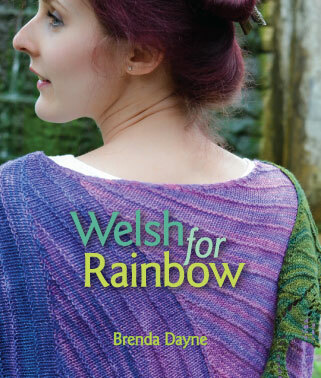 Thank you so much, Brenda, for your off-the-charts review of my book, Knit, Swirl!. It’s been a dream come true to find that my book excites the knitting world and that my Swirl is considered a “a whole new form” of sweater. Hope you will enjoy knitting yours. But watch out, say I, who just completed Swirl #29, they can be addictive. first of all: thank you so much for al your great recordings, I cherish them! It looks great and great on her, Petra, and it’s drapey and elegant, an important quality for a knitted skirt. I’m so glad you brought up the new Mary Roach book. I read “Stiff” years ago! Now I can’t wait to listen to her new book. I hope the socks find a good home. They won’t fit me. I truly hope the dolls and the journal find their way back to you. Keep us posted. Thanks for the podcasts. I hope you get your dink dolls back! i have heard that you can use boil the felted socks in a combo of Vinegar and water and it will unflet them. i have never tried this but the person who told me about it has and it works. you might want to give it a Try. Am I your only fan in Mexico? I’d love to see Uzu in person, I don’t care if they fit me or not, I’d tresasure any hand knit by you, my absolute favorite podcaster. One day I shall be independently rich and attend P3 wherever in the world it may be. Really enjoyed the episode. Onwards to 110!